Falanu Hlaalu is a Dunmer alchemist and the proprietor of All Things Alchemical in Skingrad. She sells alchemy apparatus, potions, and ingredients. She also seems to have a disturbing penchant for necrophilia. Falanu sleeps in the double bed on the second floor of her shop between 10pm and 6am. She then takes a morning walk centered on the eastern bridge in Skingrad. Between 8am and 8pm she works in the shop, where she offers her services as an alchemy merchant. After closing up shop, she will wander around the interior for two hours until she heads to bed. She wears a set of dark upper-class clothing, a black & burgundy outfit and a pair of gold trimmed shoes. She also carries her shop key and a small amount of gold. She doesn't wield any weapons, relying instead on a random set of leveled alchemist spells. "Uh...excuse me? ": "Oh. Nothing. I was just wondering." "Is it the first offense? ": "Let's assume 'no'." "Then it's at least 500 gold. ": "That's nothing compared to Morrowind. Thanks." The other residents of Skingrad have their suspicions about Falanu, and will comment that "Maybe it's just me, but I find Falanu Hlaalu really odd. And I've seen him [sic] hanging around the graveyard with a strange smile on his [sic] face." As an expert in alchemy, Falanu will give you a hint as to where you can learn more about your newly found Nirnroot: "I dunno. Never seen that sort of root before. Head over to the West Weald Inn and talk to Sinderion. He could identify it for you I'm sure." Once you have read Modern Heretics, spoken with Ulene Hlervu about "Cheydinhal", or spoken with Trayvond the Redguard, a new "Daedra cults" conversation topic will appear. When you speak to Falanu about this, she will mark Sanguine's Shrine on your map with the words: "What makes you think I'd know anything about that... But it just so happens I've run into some Sanguine worshippers up in the Imperial Reserve, a long way north-north-west of Skingrad. Can't give you any better directions, unfortunately. Traveled mostly at night with a guide, and didn't see much on the way." The dialogue hints heavily that Falanu fled the province of Morrowind, or was exiled, and that she is a necrophiliac. Necrophilia would be considered an especially heinous crime by the Dunmer, whose culture values the remains and the spirits of their ancestors highly. 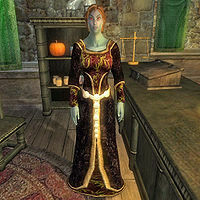 House Hlaalu's influence in Morrowind and close ties with the Empire may have saved her from a worse fate. Falanu claims to be the only alchemist in Skingrad. She probably isn't aware that Sinderion is an alchemist even though she directs you to him when you ask her about Nirnroot. Falanu should update the Seeking Your Roots quest just as other alchemists do, but the necessary script was not included on her response about Nirnroot. Falanu is supposed to head to the Chapel of Julianos at 8am and worship at the altar of Tiber Septim, but her shop AI takes precedence and she never makes the trip. The rumor about Falanu refers to her as a male, which is clearly untrue. This bug is fixed by version 1.5.0 of the Unofficial Oblivion Patch.